Torche have an uncanny ability to plunge you into their overwhelmingly sludgey swamp of a sound, where, like Indiana Jones in The Temple Of Doom the walls come closing in all around you. But then, at the moment you opt to draw that final breath, a gilt-edged hook spikes out from the mix and grabs you by the balls. This is a special band and ‘Restarter’ is their much anticipated return to the foray. The conception of this record can be traced as far back as November 2013, with Floor’s short-lived but damn potent revival breaking up proceedings last year. So, considering the loyal fan base this band has, appetites are whetted and poised to devour another Torche record at long last. The first thing that needs to be said here is that ‘Restarter’ is by no means trying to out-do its predecessors or wade out of the swamp they have so crushingly dug out from boggy, tree-flecked turf. All this is, put concisely, is another Torche record. It’s another record of their signature holler trickling out of your speakers like treacle oozing over a sticky toffee pudding – but who doesn’t like sticky toffee pudding for Christ’s sake? ‘Restarter,’ the band state, is an attempt to capture their palpable live energy and bottle into a product that sounds precisely as contemporary as present day Torche does. The energy that does indeed contort and shriek from inside the bottle of this album is feral. If it bit you, you’d most certainly get rabies. From the hammer blow opener of ‘Annihilation Affair’ – seriously, can any other band quite unfurl a punch drunk, fuzz explosion as devastating as it is fun as this band? – To the short, sharp, fast and frenetic ‘Undone,’ it ticks every box that makes up the band’s sound. Everything that you craved this album to have lurks somewhere in its depths. The former is a slow but rambunctious offering, while the latter’s syncopated guitar and snare wallop sound like a crazed knock on your door in the dead of night – it comes booming from out of nowhere, jerks you from your slumber and accelerates your heartbeat. ‘Blasted’, meanwhile, does just that to the listener. This is arguable the most ‘poppy’ of the songs on this ten track album, it harmoniously marries their enormous, tidal sound with honey drizzled vocal melodies which, like a cold breeze on an autumnal morning, brushes through you and raises the hairs on your neck and arms. ‘Believe It’ erects another wall of sound, Steve Brook’s vocals adding a spoonful of sugar to the gritty grind of guitars and sluggish thump of the rhythm section before octave chord lead work brings it to a whole other level of grandiosity. To scrape a nit comb over this record, there is little originality in the noises that rattle your eardrums here. There’s nothing we haven’t heard and felt from the Miami four piece before, but I for one am just delighted to hear another Torche record and I have no doubt that the vast majority of the already converted will see ‘Restarter’ as faultless. Another highlight is, without a doubt, ‘No Servants.’ Split into two parts, it goes from high pitched, shrilled feedback and cymbal heavy drum work alongside a soulful vocal performance before it drops, the guitars kick in and all hell breaks loose. It is here perhaps that you feel the band have best epitomised what they are all about, where their blunt force energy is at its peak. When the song finishes in a crossfire of drum fills and towering power chords, you’re left a little breathless. 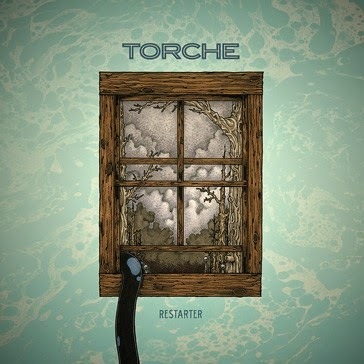 And that is what Torche do best, they arrive with a fanfare of ridiculous proportions, charm you with those almost out of place luscious vocals before wrecking your home and leaving through a broken window. You stare at the rubble and turmoil left in their wake; you turn to watch their shadows creep over the horizon until it finally disappears out of sight, just a speck in the distance. It’s all over now, who knows when they will next pay a destructive visit, but I’ll polish my best crockery for the occasion.